It’s a while ago now since Nickie and I shared what was in our January review packages from Bureau Direct and since then I’ve just been so busy using the stationery that I’ve struggled to find time to actually review it! To me though that’s a sign of good stationery – something that just gets used because it’s so perfect for the job, not just because you’re reviewing it. Firstly I was sent the Crown Mill A5 Writing Set. Now, the main reason for asking to review this was to fit in with one of my new year’s resolutions which was to sent more handwritten letters to friends in the post. As much as I love email and social media and think it’s fantastic for keeping in touch with friends and family all over the world, it just doesn’t have quite the same thrill as sending and receiving a handwritten letter. Just the exercise of sitting down with a pen and paper and writing a letter is relaxing and somehow intimate as well. So far this year I’ve written a few letters to old friends and found myself telling them so much more about what I’ve been up to and how I feel about things than I’d put in an email or a quick Facebook message. It’s been years since I’ve had some proper writing paper – possibly since I was at boarding school and writing letters to my grandmothers – so it was a real treat to open up this box and start writing on the paper. The paper itself is 100gsm Original Crown Mill paper, although don’t get caught out like I did as one side of the paper is slightly textured and harder to write on than the other side. I wasn’t really expecting this and writing in low light one evening I found myself suddenly on page two of a letter and my pen (my Lamy of course!) becoming all scratchy. I had to turn the big light on to work out why! That problem sorted though I’m loving having quality paper to write on. I chose the cream coloured set and the Lamy black ink seems to work really well on the paper. The set contains 40 sheets of A5 paper and 40 lined C6 envelopes. I guess you’re expected to just have one piece of paper per letter, but I often write more so I’m expecting I’m going to have some envelopes left over once I’ve finished all the writing paper. 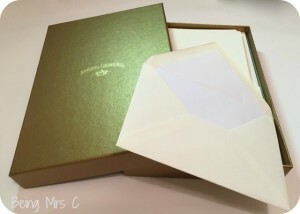 This set arrived in a gold gift box (I understand some of the sets have silver coloured gift boxes – I’m not sure if it’s a random allocation or tied to the paper colour) and Original Crown Mill is embossed on the lid. It looks incredibly smart and would make a lovely gift for anyone who loves writing letters. 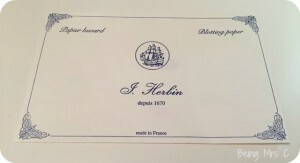 To fit in with the letter writing, the second thing I that I ordered was some J. Herbin blotting paper. 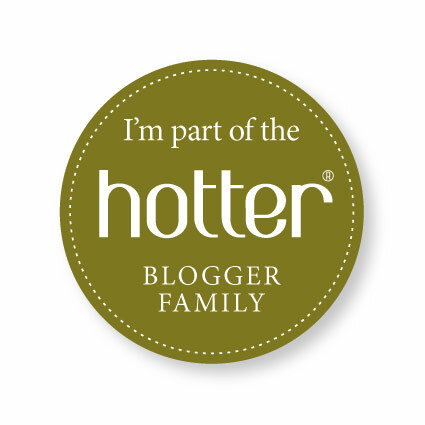 The question is though – how on earth do you review blotting paper? Well, it’s paper and it blots ink rather well! Seriously though, this has to be the smartest looking blotting paper I’ve ever seen – and it’s taught me that blotting paper is papier buvard in French. You never know when that might be useful. Measuring 19cm by 12cm, each sheet is the perfect size for slipping inside an A5 notebook and I’ve now found that I keep a piece in each of my most used notebooks – especially since I’m only using my Lamy pen or my Herbin rollerball to write everything these days! Find an experienced writer for your paper on the new kind of a business letter writing service (ThePensters). So, are you a letter writer? If so, who was the last person you hand wrote a letter to and what did you tell them? 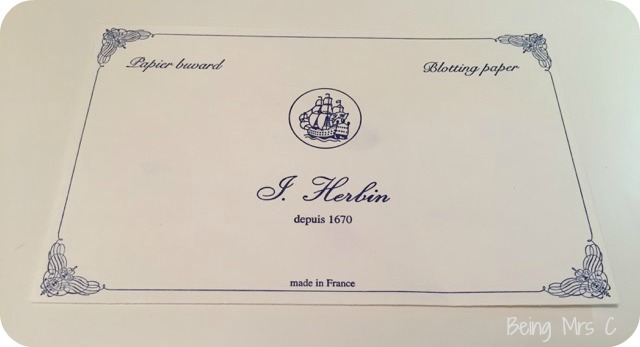 Disclaimer: I was sent the Crown Mill writing paper and the J. Herbin blotting paper as part of my role working with Bureau Direct. All opinion are my own. I always write thank you notes for everything. Aside from being grateful, I think there is nothing nicer than a hand written note popping through the letterbox! This looks gorgeous stationary, I may need to explore! I haven’t written a letter in years. Used to have millions of penpals as a child. I guess the post got so expensive didn’t it. I am a list writer though and have just made my 7 year old his own dictionary (for him to write any new words he discovers in). Glad you are enjoying your stationery. There is absolutely nothing nicer that getting ‘proper post’. I love getting handwritten cards and letters from friends, I must reciprocate more often! 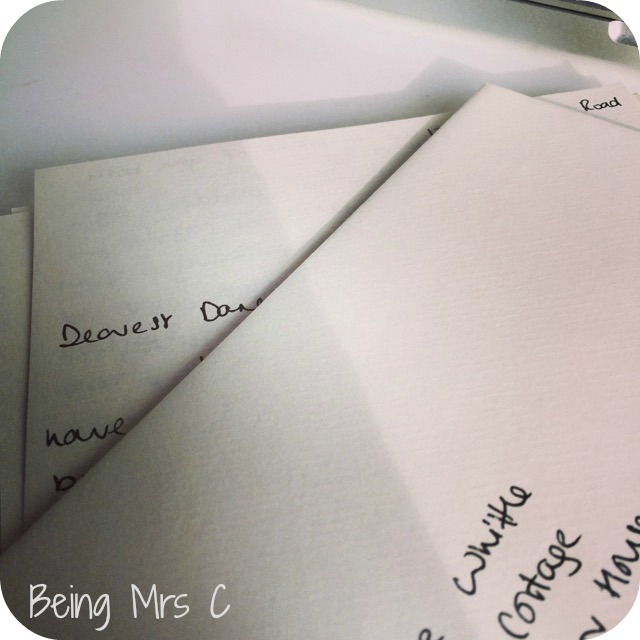 Oh I love the idea of letter writing and it is so lovely to see that letter writing is having a bit of a revival. I haven’t written a letter for years but when I was young, I had dozens of pen pals and I loved writing and receiving letters. I think you are right that letter writing is so much better and more personal and I must go and look at Bureau Direct as it sounds like my kind of website.